What Continent Is Vietnam In? Vietnam is located within the Indochina Peninsula in the southeastern portion of the continent of Asia. Vietnam covers an area of 127,888.9 square miles on the Indochina Peninsula of Southeast Asia. The Republic of Vietnam is situated on the Indochina Peninsula found in Southeast Asia. The country has a land area of 127,888.9 square miles, and the population was estimated at 94,569,072 in 2016. Hanoi is the capital city of the country while the largest city is Ho Chi Minh City. Northern Vietnam was once part of Imperial China from about 111 BCE to 939 CE. In 939, Vietnam became independent, and it expanded its boundaries but in 1954, the country was politically divided into Northern and Southern Vietnam, and this led to the Vietnam War. The war ended in 1975, and the country was unified in 1976. The name Vietnam is said to be derived from Chinese words Nam Viet, which translates to Southern Viet. Viet was derived from Bach Viet, who were a group of people residing in Southern China and Vietnam. 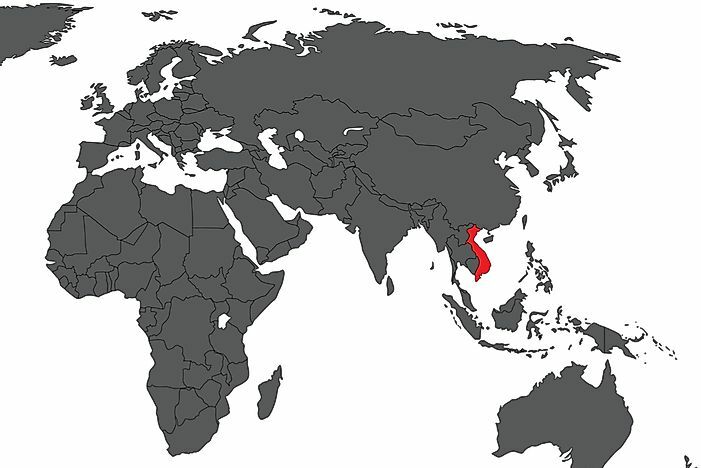 Vietnam is a member of 63 international organizations which include the World Trade Organization, ASEAN, Francophonie, and the United Nations among others. Vietnam is a socialist country that embraced communism. 40% of Vietnam’s land surface is mountainous with approximately 42% of the land covered by tropical forests. The highest mountain in the country is Phan Xi Pang standing at 10,312 feet above sea level. Vietnam’s nominal GDP ranks 47th and the GDP per PPP ranks 35th globally. The country has a mixed economy which relies on foreign direct investment. Vietnam is among the Next Eleven countries which include Egypt, Bangladesh, Indonesia, Nigeria, Iran, Philippines, Mexico, South Korea, Turkey, and Pakistan. The countries are said to have a high likelihood of growing to one of the world's largest economies in the 21st century. The country is also among the CIVETS countries which include Colombia, Egypt, Indonesia, South Africa and Turkey. The estimated 2018 nominal GDP of the country is $232.559 billion. The leading industries in the country include coffee, paddy rice, tea, rubber, sugarcane, cotton, soybeans, cashews, fish, and seafood. The tourism sector in Vietnam is vibrant, and it makes an excellent destination for backpackers and people who love culture and nature. Tourism contributes to about 4.5% of the country's GDP. Vietnam is home to six biosphere reserves and two World Natural Heritage Sites; it has also been ranked 16th globally in biological diversity. Asia is one of the continents situated in the north-eastern hemisphere. It has an area of 17,212,000 square miles, and it covers 30% of the Earth's land surface. Vietnam is located in Southeast Asia which consists of countries that are east of India and South of China. The region has an area of 1,735,121 square miles, which is equivalent to 10.5% of Asia’s total landmass. Southeast Asia comprises of Maritime Southeast Asia and Mainland Southeast Asia. Cambodia, West Malaysia, Thailand, Laos, Vietnam, and Myanmar makes up Mainland Southeast Asia which was known as Indochina in the past. Southeast Asia is made up of 11 independent countries and two dependencies. The countries include Vietnam, the Philippines, Singapore, Thailand, Myanmar, Laos, Indonesia, East Timor, Malaysia, Cambodia, and Brunei Darussalam. The dependencies include Cocos (Keeling) Islands and Christmas Island. What Do The Colors And Symbols Of The Flag Of Vietnam Mean?